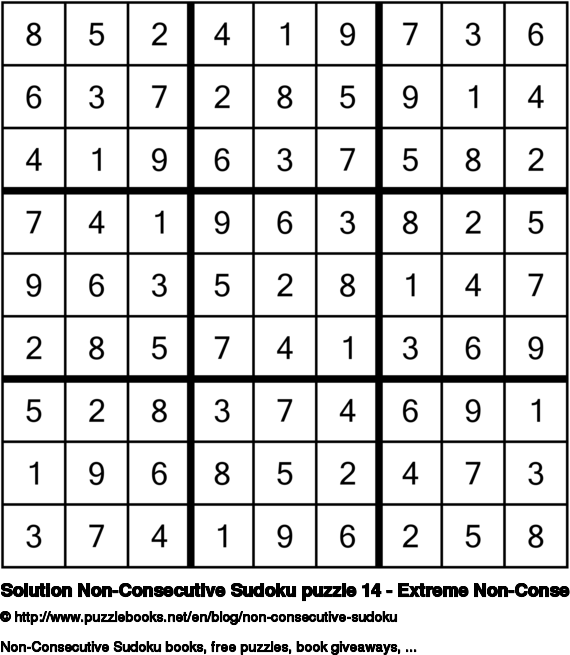 Click here to view the solution for Non-Consecutive Sudoku puzzle 14 - Extreme Non-Consecutive Sudoku 9x9. I hope you managed to solve it and had a lot of fun trying to do so. Addicted to Non-Consecutive Sudoku puzzles? Today I have another Non-Consecutive Sudoku puzzle for you. Lots of pleasure trying to solve it. 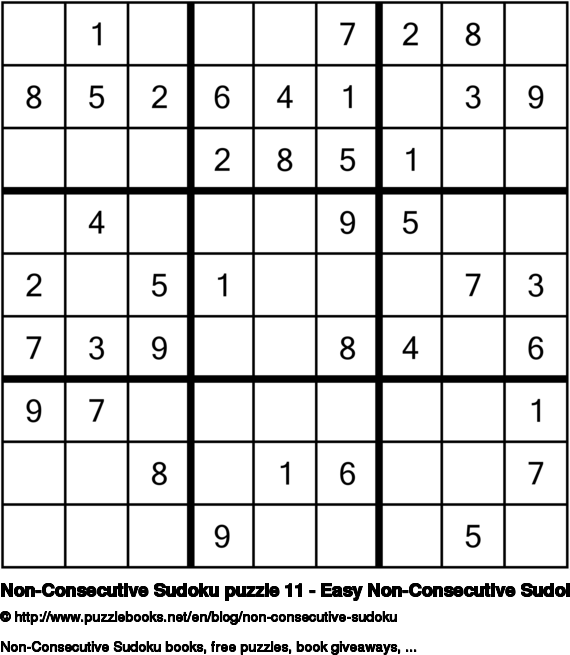 How to play Non-Consecutive Sudoku: The goal of Non-Consecutive Sudoku is to fill in the empty cells, so that each column, row, and region contains each number exactly once. Furthermore, no two adjacent cells have consecutive values. For example, if a cell contains 3, then any neighboring square cannot contain either 2 or 4. 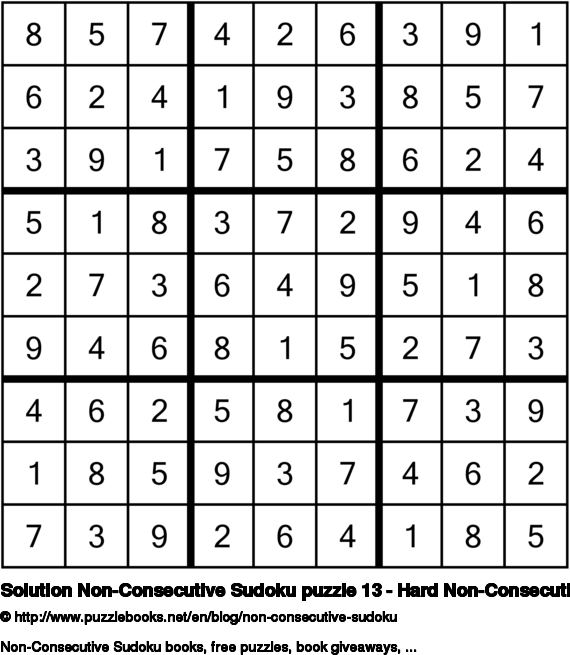 Click here to view the solution for Non-Consecutive Sudoku puzzle 13 - Hard Non-Consecutive Sudoku 9x9. I hope you managed to solve it and had a lot of fun trying to do so. 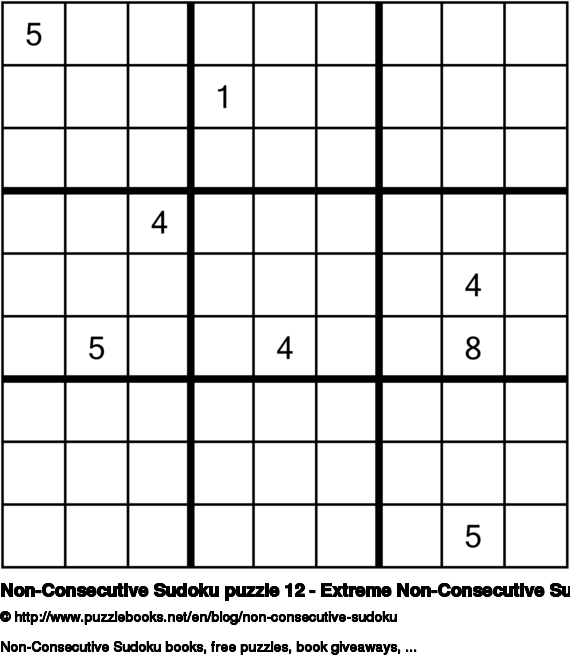 Is solving Non-Consecutive Sudoku puzzles an obsession for you? You will most certainly enjoy today's Non-Consecutive Sudoku puzzle. 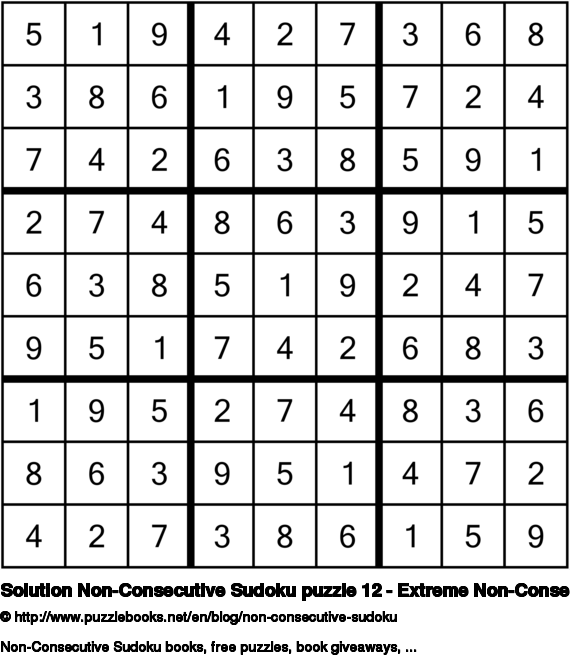 Click here to view the solution for Non-Consecutive Sudoku puzzle 12 - Extreme Non-Consecutive Sudoku 9x9. I hope you managed to solve it and had a lot of fun trying to do so. 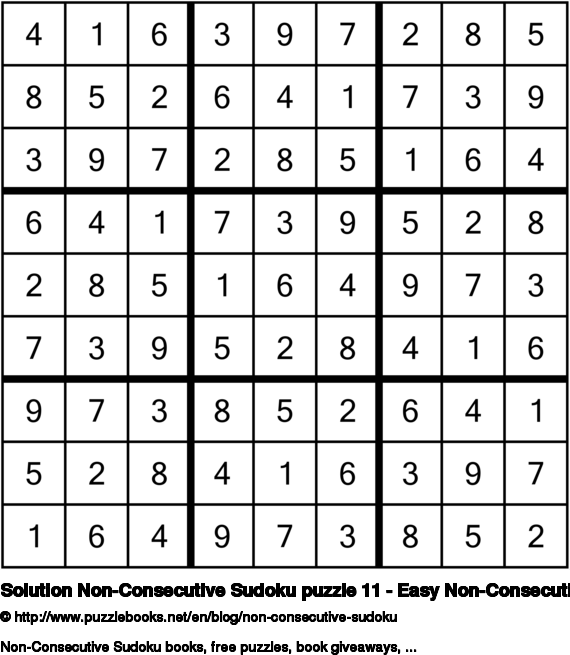 Click here to view the solution for Non-Consecutive Sudoku puzzle 11 - Easy Non-Consecutive Sudoku 9x9. I hope you managed to solve it and had a lot of fun trying to do so. 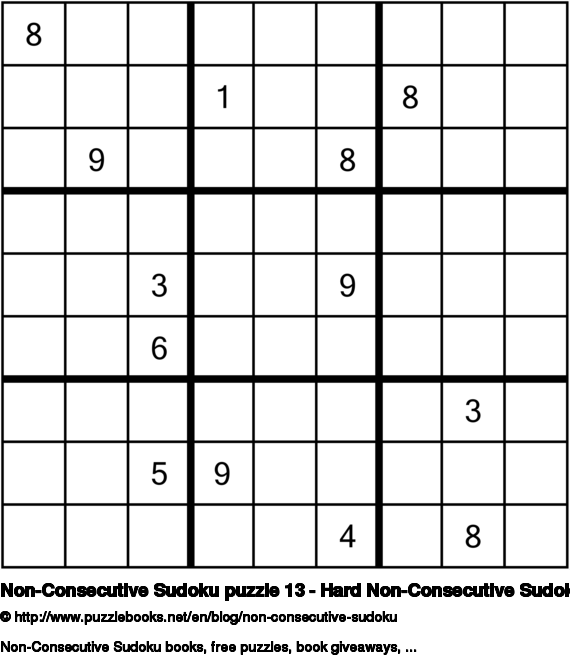 Hooked on Non-Consecutive Sudoku puzzles? Today I have another Non-Consecutive Sudoku puzzle for you. Lots of fun trying to solve it. 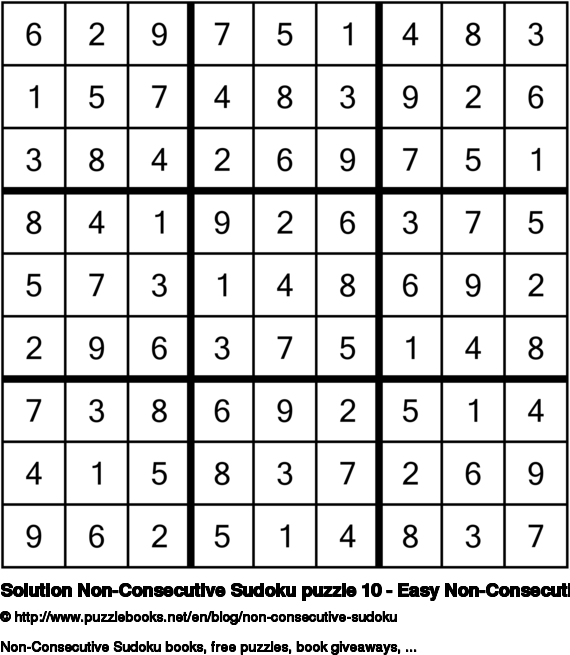 Click here to view the solution for Non-Consecutive Sudoku puzzle 10 - Easy Non-Consecutive Sudoku 9x9. I hope you managed to solve it and had a lot of fun trying to do so.